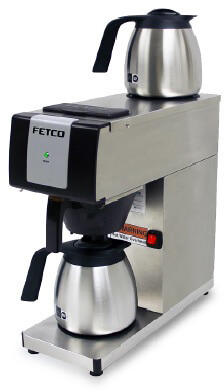 New from Fetco the CBS-2121-C212101 pourover coffee brewer offers the exceptional quality known to Fetco in a simple, easy to use machine. The C212101 model is designed for use with industry standard 0.5 gallon (64.oz) thermal dispensers and has many features for increased convenience. Standard 120V: This unit is ready to "plug and play" right out of the box. A switch illumites when in the "on" position and the green ready light on the front panel illuminates when the machine is ready for the next brew. The dedicated on/off switch locate on the lower front panel allows for easy power control, no more needing to plug/unplug the unit to turn it on or off! Dimensions:19" x 7.75 x 19"